Everyday energy self care is critical to health and wellness. This is true on an energetic level, just as it is on a physical level. We all have our daily rituals and regimens to take care of our physical bodies: bathing, brushing our teeth, taking our vitamins, exercising, etc. And we all know how important these things are. It's just as important to clear, nurture, and support your personal energy on a regular basis. Your methods of energetic "hygiene" don't have to be long, involved, or esoteric. In fact they can be quite simple, easy, and pleasant to integrate into your daily life. You undoubtedly already do some of them. But however you do it, it's important to establish a conscious regimen of some sort to help clear and support your energy systems. This helps to build and maintain physical wellness, emotional wellness, and mental wellness as well. Centering yourself is one great foundational practice to learn. Another powerful tool for energy self-care is your breath. Learn 9 ways to use breath for self-healing. Spaciousness is an often overlooked aspect of self-care for energy healers. Here's how to cultivate a calm, uncluttered, spacious environment--inner and outer--that makes room for the magic of Energy, Healing and Intuition to show up. And yet another important form of every-day self-care is simple self-kindness. Many of us are shockingly judgmental of ourselves. Read more about this crucial practice here. It's also helpful to have some techniques for energetic "first-aid" -- shifting your energy when life's little scrapes and bumps send you into a tailspin, threatening to plunge you into an all-day funk. By working with your energy, you CAN change your reaction and your mood. Life's too short to lose a day to a bad mood! You'll also find ideas for crisis self-care in my "Advice to Readers" series, with advice for real-life situations including the illness of a beloved sister, premature kundalini opening, protecting the aura from negative energy, negative relationship patterns in a marriage, concern about the state of the world, and just general miserableness. Sometimes you may need to clear your energy field. We can take on the energy of other people or situations, accumulate emotions that we should let move through us, store traumas or events from the past, or hold on to energy that doesn't serve us any more for a variety of reasons. Learn about aura cleansing and clearing here. It'll help you create some good clean energetic space for yourself. And, it's important to have some chakra healing techniques in your self-care "tool kit." Find out more about chakra healing here, including links to a chakra meditation, exercises for chakra opening, information about chakra blockages, and ways to clear, balance and align the chakras with sound, gemstones, and essential oils. And here’s a link to my friend Elle’s excellent meditative chakra balancing video that leads you through opening and balancing of all your seven chakras through simple movements and yoga poses. 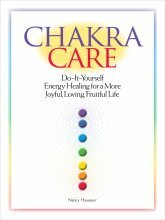 Or if you'd like lots more ideas for chakra opening and balancing, you may enjoy my book, Chakra Care: Do-It-Yourself Energy Healing for a More Joyful, Loving, Fruitful Life, which I wrote to help people understand and work with their own chakras. Tracing your meridians is a simple, effective way to keep your meridians balanced and flowing, with wonderful benefits for your mental, emotional and physical health. Learn how here. For anyone who uses his or her hands for healing, blessing or other sacred work, hand blessing ceremonies are a lovely, poetic, deeply satisfying form of energy self care. Taking care of your energy is one of the best investments you can make in your own wellbeing. And, it feels GOOD--so enjoy! Click here to return from Energy Self Care to site home page.